The new BMW K 1600 GT. 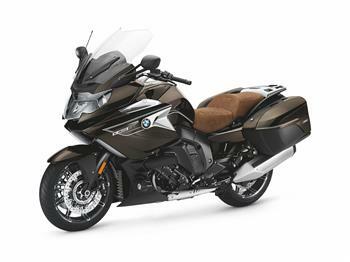 BMW Motorrad announces pricing for the new BMW K 1600 GT and GTL. BMW Motorrad Six-Cylinder Technology Day: 2. Drive. Lightest and most compact serial production six-cylinder in-line engine in a motorcycle. BMW Motorrad Six-Cylinder Technology Day: 3. Chassis. Low overall centre of gravity, very favourable concentration of masses and ideal static wheel load distribution. BMW Motorrad Six-Cylinder Technology Day: 4. Electrical system and electronics. The first motorcycles in the world with adaptive xenon headlight for even greater safety at night. BMW Motorrad Six-Cylinder Technology Day: 5. Body and design. Innovative design which sets the benchmark for touring bikes. BMW Motorrad Six-Cylinder Technology Day: 6. Equipment program. Special equipment features and special accessories - perfect individualisation from BMW Motorrad. 2017 BMW K 1600 GT Spezial.